About a year and half ago, I blogged about finding retro breakfast cereal boxes at my local Target store. I was very excited to find them, as they brought back my early memories of eating my favorite cereals. So this last week, while shopping at Target, I found more retro boxes. Instead of buying them all, I decided to get just one – Cocoa Puffs. 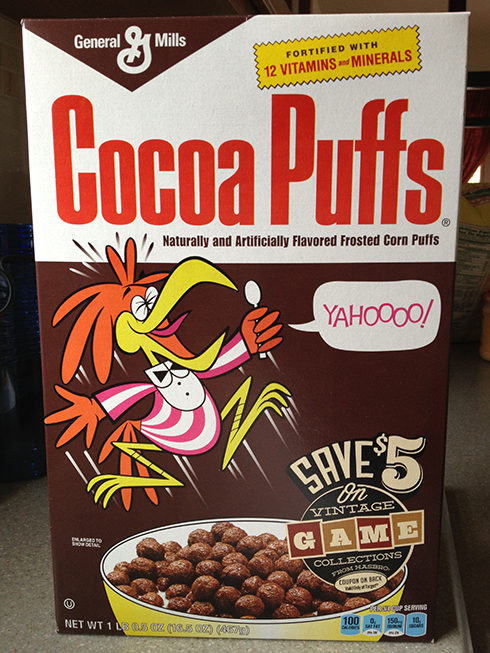 I’ve not had Cocoa Puffs in several years, so I used my love of all things retro to try them again. Chocolate balls of corn that have a lot of sugary sweetness baked into them. Served in a large bowl, with milk poured over them, these Cocoa Puffs didn’t fail to make me smile. I still rate Lucky Charms higher in my ranking of favorite breakfast cereals, but it’s good to try something else you’ve not had for a while. Look for the other retro boxes at your local Target store: Cheerios, Honey Nut Cheerios, Cinnamon Toast Crunch and the afore mentioned Lucky Charms. The problem being that the cereal inside isn’t retro as well. It’s the “new” style which doesn’t taste nearly as good. I think the new styles of the food are not 100%, but I do get some great memories from seeing the box. Has Cinnamon Toast Crunch actually been around long enough to have a retro box? I guess so. I know the Lucky Charms boxes have gone retro multiple times, but I didn’t eat Cinnamon Toast Crunch all that often.